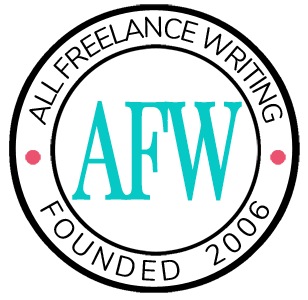 Earlier this month I shared five freelance writer websites to give you a bit of inspiration if you're building your own or updating your existing professional site. But while having inspiration helps with basics of design & site structure, how do you actually evaluate your existing site's copy or content to decide what needs to change? One way to do this is to conduct a content audit of your website. Today, let's talk about what these are and how you can use one. Then, in my next post, I'll use my site (which is undergoing changes this month) as an example to show you the kinds of things that you'll want to look at and update from time-to-time. 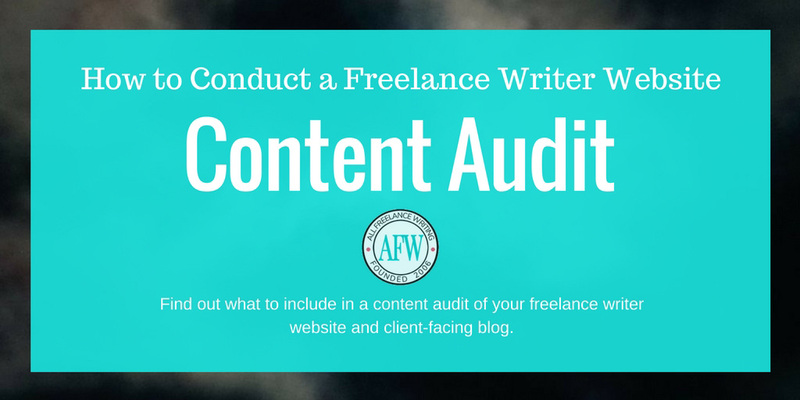 A content audit for your freelance writer website is basically just an inventory of your existing content, notes on actions to take to improve it, and gaps in coverage that you'll want to fill. Does this content still have any purpose, or should it be removed? Is this content too similar to other content on your site (where it should be removed or merged)? Does the on-page SEO (keywords, meta title, meta description, etc.) need improvement? Is the content outdated and in need of updates? Are there on-page style problems that need to be addressed (this can happen if you've ever updated a theme)? Should the content be moved elsewhere (such as if you previously published blog content irrelevant to your prospects and you're now trying to clean that blog up)? Is the content still good as-is? Downloadable resources your site might include -- Are they still relevant? Your prices -- Is it time to update them? Your portfolio -- If you link to live samples, are they still available (sometimes clients shut down projects)? Any forms on your site -- Test them & decide if they could be optimized (like turning a generic contact form into a project brief form like the one I use on my Contact page). Think about services prospects often request. Are you getting requests not featured in your service list yet? Add it. Create a sales page for it. Add it to your rate chart. Have you received a lot of the same questions from prospects? Consider adding an FAQs page, or add those questions to your existing page. If you were hiring a freelancer, what kind of information would you want to know? Make sure your site includes it -- service info, rates, samples, etc. Add whatever you're missing. Does each page have an appropriate call-to-action (CTA)? If not, add one. Conduct basic keyword research to see what prospects might be searching for when looking for a writer like you. Do you have pages or blog posts to help you rank for those phrases, answer those questions, or solve those problems? If not, schedule something new. Is your site lacking features or resources that might help you land more gigs? Add them. For example, if you're targeting high-level professionals (like CEOs or Marketing Directors for corporate clients), you might benefit from more detailed resources and thought leadership pieces like white papers and in-depth case studies. Or maybe a short e-book or other downloadable resources would help you showcase your expertise and stand out among your competition. At this point you should know what needs to be updated, added, removed, merged, or left alone content-wise on your site. That's what a website audit is all about -- making it a better resource tomorrow than it is today. 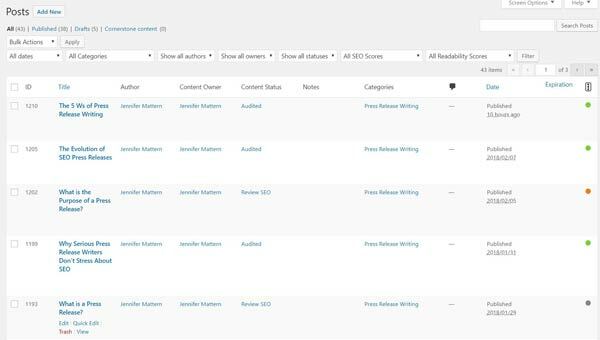 If you run your freelance writer website on WordPress (which I highly recommend), you might find it easiest to use a plugin to help you with a content audit. I had one privately created for my sites a while back that allows me to export post info for a content audit spreadsheet. That was specifically for SEO audits. But more recently I've been using a plugin simply called Content Audit that lets you work on your audits directly in WordPress. 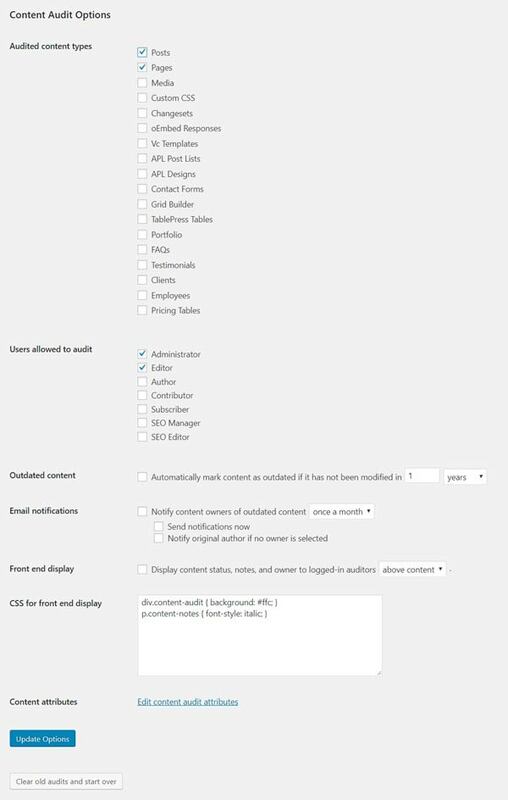 You can choose what kind of content is available for audit in the plugin's settings -- posts, pages, media, custom post types, etc. You can have posts automatically marked as "outdated" when they hit a certain age. And you can include notes to give more specific details for each audited item (such as what post you want to merge another with). You also have the ability to edit or add to the attributes I mentioned above. For example, during a recent brand split, I added an option to mark posts meant to be moved to the new brand's blog. You can add anything you want to that list, making it as specific or as general as you want. And you can choose multiple attributes for each post. So, for example, you might get rid of the "Review SEO" attribute and instead add more specific attributes like "update meta description" and "update meta title." Then you can choose the specific one you want (or several). And when looking at your post list in the WordPress admin area you can filter the post list by any of those things depending on what you feel like working on any given day. A website audit might sound intimidating at first. But it doesn't have to be. Just use a spreadsheet or a plugin if possible to help you keep things organized. And start with your pages rather than blog posts -- you probably have fewer to worry about, and they're likely doing more than individual posts to sell your services anyway. Start small by focusing on those, then expand to the rest of your site once you get the hang of it. How often should you audit your site? That's really up to you. In my case, I try to review basics every year (rates, services being featured, potential design issues, and top-viewed pages). Then I do a more thorough audit either every few years or after big changes (algorithm changes or my own broader business changes). If your site isn't delivering prospects to your virtual door or converting them into clients, that's the ultimate sign it's time for an update. Later this week I'll go through my own site with you to explain its structure, why I made certain decisions, and what changes I'm working on this month as a result of my own content audit so you can get a better idea of the kinds of improvements you might want to make to your own. Do you have a favorite content audit tip or tool to recommend? Tell me about it in the comments.